(a) Collets - Small and round shape jobs are held in collets. Its biggest advantage is easy handling. Generally three types of collets are used these are push out, draw in, dead length type. (b) Self-Centring Chuck - These chucks are having three jaws. All the three jaws operate simultaneously by the rotation of a scroll and grip the job quickly while cantering it. The chuck is suitable for large diameter bars, circular castings and forging etc. 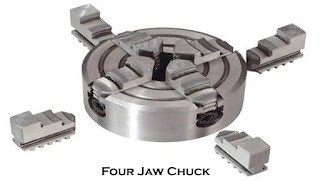 (c) Four Jaw Independent Chuck - These chucks are having four jaws. This type of chuck is occasionally used for gripping irregular shaped work pieces, where the number of articles required does not justify the manufacture of a special fixture. Each jaw of this chuck is operated independently and is reversible. 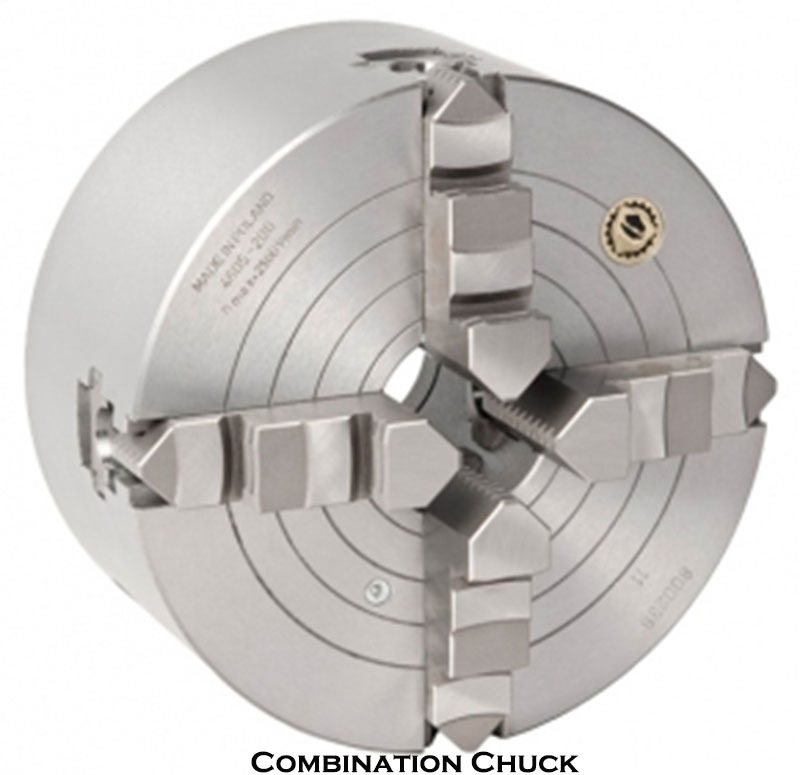 (d) Combination Chuck - The combination chuck is used for holding variety of work following the principle of self-centring and independent jaw chuck. 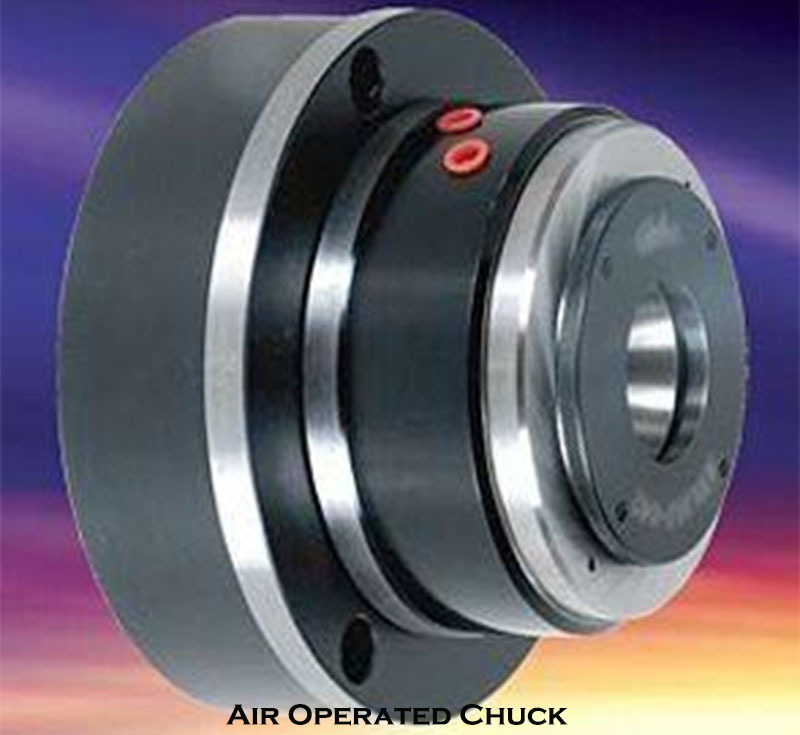 (e) Air Operated Chuck - Heavy-duty turret lathes are equipped with air operated chucks for certain distinct advantages. The chuck grips the work quickly and capable of taking powerful grip with least manual exertion. 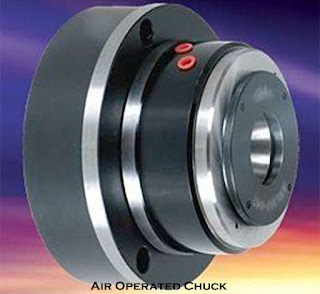 The chucks are operated by air at pressure of 5.5 Kg/sq cm to 7-kg/sq cm or 80 Lbs/sq inch. 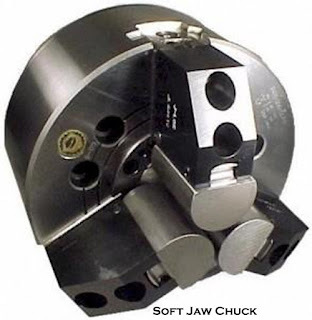 (f) Soft Jaw Chuck - To ensure long life, chuck jaws are normally hardened. For gripping certain classes of work the chuck jaws are made of soft material. 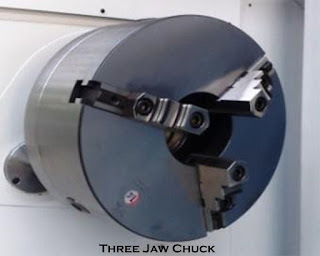 Certain jobs, which have been machined, previously required to be gripped on chuck jaws on the machine surface for subsequent operations. 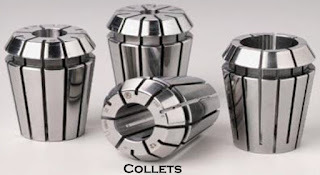 The soft jaws prevent any damage to the machined surface by the serrations of jaws. For gripping very irregular shape of the work. Soft jaws are used which grip the contoured profile efficiently. Tapered components are also suitably held on soft jaws.